Equipment at the Field Research Station in southern Alberta. The research program at the Containment and Monitoring Institute’s Field Research Station (FRS) has grown again with the addition of Cenovus Energy as a Joint Industry Project subscriber. As a subscriber, Cenovus has the opportunity to prioritize and bring forward new research directions and provide guidance on the overall research program. They also have, along with other subscribers, first access to research results. This is not the first time Cenovus has provided support to the 200-acre research station south of Brooks. It owns the 200-acre property on which the research station is situated and leased the property to the Containment and Monitoring Institute (CaMI) at no cost. “We are excited to bring Cenovus on board as a subscriber. They’ve already demonstrated support for the Field Research Station by providing us with a no-cost, 10-year lease on the land in Newell County. Signing the subscriber agreement affirms their interest in our research and development work at the field site,” says Don Lawton, Director of the Containment and Monitoring Institute and Professor of Geophysics at the University of Calgary. 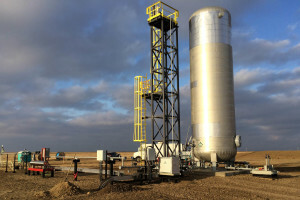 Researchers and technology developers from industry, government and academia are working at the site to develop tools to verify containment and conformance of stored CO2 and other adjacent applications such as steam chamber monitoring in oil sands production. Results will inform governments and industry of best practices in monitoring protocols so the most effective and cost efficient methods can be employed at commercial sites. There is growing interest in the site from both domestic and international researchers and companies. As a subscriber, Cenovus joins Shell Global Solutions and the environmental research organization RITE Japan. Technologies are being tested and demonstrated at the site by researchers from organizations and universities around the world including Lawrence Berkeley National Laboratory, GFZ German Research Centre for the Geosciences, Imperial College London, University of Edinburgh, and Norwegian research organizations SINTEF and Christian Michelson Research. Technologies currently situated at the site include broadband seismometers, a seismic array, an electrical resistivity tomography array, fibre optic cables for acoustic and temperature sensing as well as distributed heat pulsing, down hole equipment for seismic cross-well surveys, and a U-tube system for sampling fluids from the injection reservoir. For information on how to subscribe to the research program at the FRS, contact Don Lawton at don.lawton@cmcghg.com or call 403 210-6671.